In Captain America: Sam Wilson #10, the character whose death gets Captain Marvel and Iron Man fighting over a philosophical difference gets laid to rest. It’s a pretty emotional service. The homegoing for James Rhodes is significant because the Marine who flew the black-and-white Stark Industries armor is getting laid to rest like a hero, not an embarrassing casualty. If the death of War Machine was the lemon that Marvel editorial handed to black superhero fans last month, then the soulful portrayal of Sam Wilson’s unease is the lemonade that those fans will have to assuage themselves with. The last time a black hero died in a Marvel Civil War event, it was all sour and no sweetness. Super-scientist Bill Foster (a.k.a. Black Goliath/Goliath/Giant-Man) was killed by a clone of Thor and his funeral in issue #23 of the 2005 Black Panther series was written as a polemic by Reginald Hudlin. Hudlin’s pointed writing was the proverbial “phone call from a bogeyman coming from inside the house”—he was a black writer commenting on the death of a minor black character to motivate the battles between major white heroes. The rainy, sparsely populated funeral scenes with Foster’s surviving family were a small reservoir of bitterness that showed the character’s death has more meaning than just being a tired plot device. Despite the considerations that went into the decision, Rhodey’s death still stinks. It robs fans of the evolving history of that character and the symbolism that comes with him being a seasoned veteran. There might be other brown faces rising through the panels wearing armor that looks like his but they’re getting introduced in a smaller, more charged landscape. They’re not the same as a character who survived the ups and downs of the comics business’ flush and fallow periods. Nick Spencer’s work in Captain America: Sam Wilson #10 responds to that loss well. The issue reads as if it’s intentionally designed to be the polar opposite of that nine-year-old Black Panther story. There’s a different, more celebratory kind of grief on display here, one that starts with a gathering of Rhodey’s friends and peers. Spencer has been using Sam Wilson’s tenure as Captain America to explore the symbolism attached to that particular heroic mantle, as well as working in allusions to the racial and socioeconomic tensions in America right now. But there’s been great character development for the lead character, too. 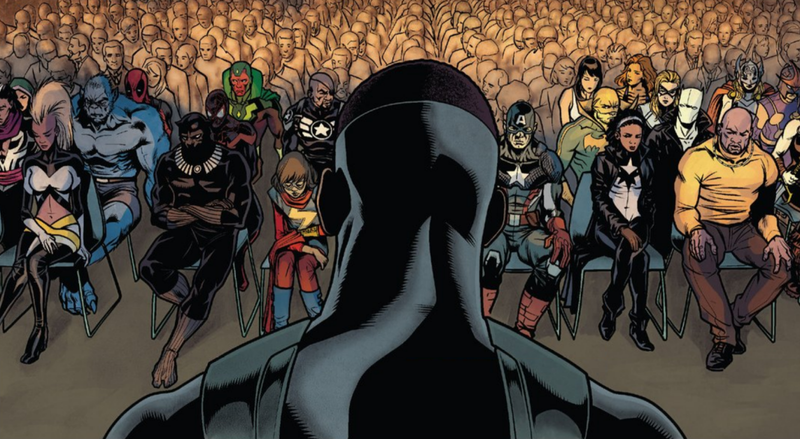 Take the scene where the assembled heroes argue about the issue at the heart of Civil War II, only to silently agree on who should deliver Rhodey’s eulogy. The speech that Spencer writes for Sam recognizes Rhodey’s loss in a metatextual way—invoking the particular experiences of what it means to be a black person in America—which right now feels the best possible consequence from his death. It’s all too rare that you get to see a gathering of Marvel’s major black heroes in one place. (The excellent Mighty Avengers series written by Al Ewing often approached a quorum.) Too bad it takes a funeral to get everybody together.